40 mm Bofors Mk215 х 4 pcs. 20 mm Oerlikon Mk425 х 1 pcs. 20 mm Oerlikon Mk205 х 2 pcs. 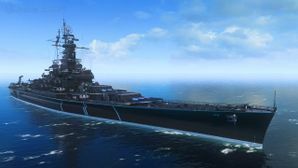 Massachusetts B — American promo premium Tier VIII battleship. Massachusetts B is the second South Dakota-class battleship to come to World of Warships, and — despite appearances — plays very differently than her sister Alabama in several ways. The primary differences are found in her main and secondary batteries. Massachusetts B’s main battery has a lower sigma value and worse dispersion than that of her sister, and will generally produce slightly worse shot groupings than Alabama. The difference is slight, but noticeable. It will lead to some accuracy issues at long range, and encourages captains to close the range against enemy ships in order to improve her hit percentage; this style of play is further reinforced by her reduced main battery range compared to Alabama as well. Where Massachusetts B really departs from Alabama is in her secondary battery; indeed, Massachusetts B is unique among American battleships with the power of her secondaries. Her secondaries fire faster, farther, and are far more accurate than those found on any other American battlewagon. Sporting a four second reload, a max range of 11.3km, and incredible accuracy with the right buffs — such as Mike Yankee Soxisix flag ( ), Secondary Battery Modification 2 ( ), and the captain skill Manual Fire Control for Secondary Armament — Massachusetts B are a terror to all enemy units that are spotted within range. Enemy destroyers in particular must be wary; these secondaries will tear them apart in very short order if they are not actively maneuvering while spotted under Massachusetts B’s guns. Massachusetts B brings with her the typically powerful anti-aircraft battery that veterans of high tier American battleships are accustomed to. She packs in a few more 40mm Bofors mounts than Alabama, and her dual purpose 127mm guns remain as potent as ever. Just like Alabama, Massachusetts B has a small turning circle allowing some tight turns for dodging torpedoes and shells. All told, Massachusetts B is an American battleship built for mid- and close range brawling, but may struggle at long range due to her dispersion and slow shell velocity (similar to North Carolina), but played well, and thanks to those secondaries, she can be a monster in players hands. Longer range, faster firing, more accurate secondaries than Alabama. Shorter than North Carolina, with excellent handling characteristics. Decent concealment for a battleship. Reduced cooldown on Repair Party ( ) consumable. Lower main battery accuracy and range than Alabama. Slightly worse torpedo protection than Alabama. Buffed secondary battery may encourage captains to overextend too early in an attempt to use them. 32mm plating vulnerable to enemy high explosive rounds. As a premium ship, Massachusetts B doesn't have any upgrades to research. Captains looking to improve upon the ship's anti-aircraft armament may find AA Guns Modification 1 ( ) more useful in place of Secondary Battery Modification 2. Key skills for Massachusetts B commanders include Adrenaline Rush, Basic Firing Training, and Manual Fire Control for Secondary Armament. A good Massachusetts B will find themselves in brawling range of enemy ships regularly, and is well-advised to invest in Damage Control Party II ( ) and Repair Party II ( ) to maximize survivability. As a premium ship, Massachusetts B comes included with Type 10 camouflage that lowers her detection radius, reduces the accuracy of incoming shells, and increases the amount of experience she earns. Three (3) Vought OS2U "Kingfisher"
USS Massachusetts (BB-59), second-to-last of the South Dakota-class battleships, was laid down at Bethlehem Steel Corporation in Quincy, Massachusetts on 20 July 1939, launched 23 September 1941, and commissioned on 12 May 1942. She was the seventh ship of the United States Navy to be named in honor of the sixth state. Immediately after her shakedown cruise in the Caribbean, Massachusetts — lovingly dubbed "Big Mamie" by her crew — set sail for the Atlantic on 24 October 1942, where her formidable first mission would be serving as the flagship for Admiral Henry Hewitt during Operation Torch – the Allied invasion of French North Africa. Just over two weeks since she set sail from the USA, Massachusetts found herself in her first battle against Vichy French forces on 8 November when the Naval Battle of Casablanca begun. Supported by USS Tuscaloosa (CA-37), USS Wichita (CA-45), and four destroyers, Massachusetts came under fire from shore batteries outside Casablanca, and she responded by opening fire on French battleship Jean Bart anchored in Casablanca harbor. Forced to retreat from mainland France to escape advancing German forces only to fall into hands of Vichy French forces, Jean Bart only had one of her two quadruple 15-inch turrets installed. At a range of 22,000 meters, Massachusetts pounded Jean Bart for an hour and a half, disabling Jean Bart’s only operational turret, and sinking a pair of merchant ships. Massachusetts unleashed her fury upon the Vichy French ships, also sinking a pair of L’Adroit-class destroyers and the Duguay-Trouin class light cruiser Primauguet. She moved on to bombard shore batteries and ammunition dumps, until she was ordered back to the United States on 12 November. She had fired 786 of the 800 16-inch rounds she carried, expending 98% of her ammunition, with several kills and a disabled battleship to her name. Transiting via the Panama Canal, Massachusetts arrived at New Caledonia to fight in a new theater: the Solomon Islands campaign. Despite the Allied victories at the Coral Sea and Midway, the Solomons were a grueling stalemate that gradually turned towards the favor of the Allies. Massachusetts protected convoy lanes and supported operations from March 1943 onwards, providing cover for aircraft carrier strike groups across the Gilbert Islands. On 8 December 1943, Massachusetts joined a six-battleship strong force that bombarded the island of Nauru, a lynch pin in the Japanese efforts in the Solomons, causing severe damage to the vital shore installations, including a phosphate-production center. Her next big mission was a daring and aggressive strike on the Japanese stronghold of Truk, in an attack dubbed Operation Hailstone. On 17 February 1944, Massachusetts joined the massive force including 5 fleet carriers and 4 light carriers, alongside six other battleships that fell upon Truk. The Japanese lost two light cruisers, four destroyers, over a dozen transport vessels and hundreds of aircraft, and were dealt a severe blow to their morale. As part of Task Force 38, Massachusetts defended her task force against heavy Japanese air attacks as her allied carriers raided Saipan, Tinian, and Guam. Much of Massachusetts’ duty with Task Force 38 was protecting allied carriers and supporting naval landings, and she kept this up until 1 May 1944, when she was finally able to retire to the mainland United States for a few months of crew leave and some much-needed maintenance. Her refit complete, Massachusetts sailed from Pearl Harbor at the beginning of August with a fresh coat of paint to re-join the war in the Pacific. Sailing from her new base in the Marshall Islands on 6 October 1944, Massachusetts joined the final great naval battle of World War II: the Battle of Leyte Gulf. In the days before this, "Big Mamie" supported fleet strikes against Okinawa and Taiwan on 10-14 October. When the battle truly begun, Massachusetts provided anti-aircraft cover for Task Group 38.3, while American fleet carriers sunk four Japanese carriers off Cape Engaño. Aside from finding herself fighting Typhoon Cobra — which claimed 3 destroyers and hundreds of sailors from Task Force 38 — Massachusetts’ duties in the final years of the war were almost exclusively guarding carriers that struck Japanese-held islands across the Pacific, edging ever closer to the Japanese mainland itself. On 1 July 1945, Massachusetts received her final mission: to join the Third Fleet’s last offensive against Japan. On 14 July, she joined an American/British/New Zealand force that bombarded Japanese mainland industrial facilities on Honshu around Tokyo. Her last bombardment was on 9 August, where Massachusetts herself fired the last 16-inch shell of World War II. After the war, Massachusetts sailed to Puget Sound again, and following training operations off the California coast in 1946, she joined the Atlantic Fleet Reserve at Norfolk, Virginia on 27 March 1947. She was stricken from the Naval Vessel Register come 1 June 1962. Rather than heading to the breakers, however, "Big Mamie" was saved from the scrapyard by the joint effort of veterans and citizens of Massachusetts and was successfully transferred to the USS Massachusetts Memorial Committee on 8 June 1965. She sailed to Battleship Cove in Fall River, Massachusetts, where she has remained ever since, barring a visit to a Boston shipyard in 1998-1999 for overhaul. Massachusetts is open today as a museum ship, owner of 11 battle stars, bearing the distinction of having fired the first and last American 16-inch shells of the war, and notable as the mightiest ship amongst the ensemble present and open at Battleship Cove. Massachusetts is depicted in 1946 condition, when she was still painted in Measure 22 camouflage (Navy Blue lower hull with Haze Gray above that). However, while the ship was still in Supertest, Wargaming replaced it with Measure 32/1D. This dazzle camouflage was designed in 1943 but was never applied to Massachusetts or any other ship of her class. Despite the in-game images showing Massachusetts in Measure 22 camouflage, the scheme is not available on the ship, having been removed during Supertest. USS Massachusetts (BB-59) under construction at Bethlehem Steel Corporation. Massachusetts being launched on September 23, 1941. Massachusetts being refueled at sea. Massachusetts off the coast of Point Wilson, Washington. Massachusetts off Casablanca, 8 November 1942. A large ship resting on the water under a bridge, smaller boats are visible in the foreground along with a ripple effect on the water. Massachusetts refuels two Fletcher-class destroyers, 1944. Massachusetts shelling Kamaishi, Honshū, Japan on 14 July 1945. Outbound projectiles of a full broadside of her 16" guns are visible in upper left of photo. Massachusetts, starboard stern quarter view. Massachusetts in Battleship Cove in 2012. This page was last modified on 19 February 2019, at 08:46.